It is an exciting time to be in the beef industry, with high cattle prices and increasing demand for our quality product, a gathering of young beef producers in Roma, Queensland was told this morning. 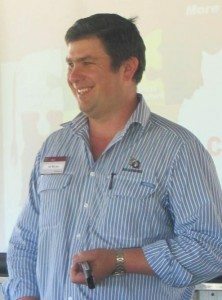 But even with the current level of returns for livestock, considerable variation exists in financial performance between enterprises, business advisor Ian McLean told about 170 people attending the annual Young Beef Producers Forum. He said any discussion on future performance should start with an understanding of current and past performance of beef producers in Australia. The best available data on long-term national industry performance was the ABARES farm survey data. 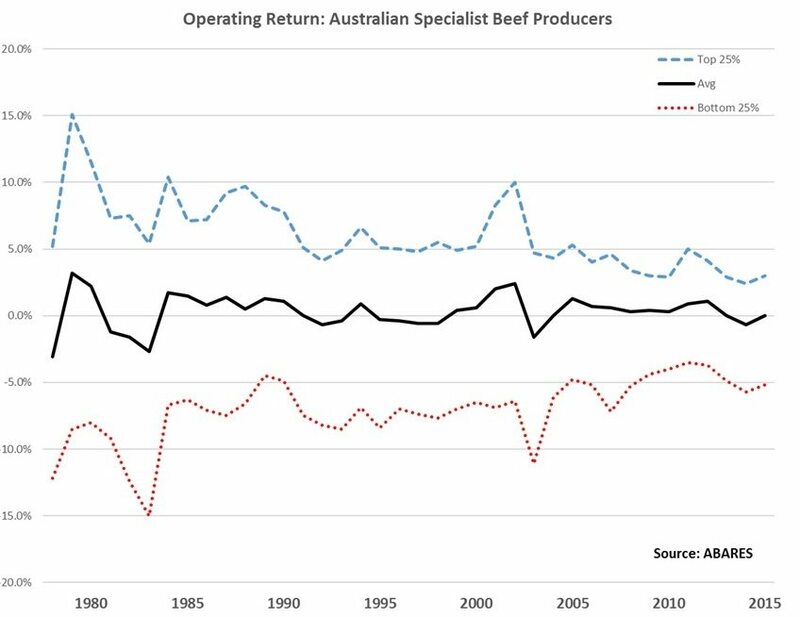 “Analysis of this data shows that the total returns achieved by specialist beef producers in Australia over the last 38 years averaged 5.8 percent per annum,” he said. the capital gains from owning the land (capital return). “If we split the 5.8pc up into these two components, just 0.3pc is from the operating return and 5.5pc is from capital return,” he said. Operating return was therefore arguably the more important of the two, Mr Mclean told the forum, as it was largely within the control of managers and generated cashflow for the business. “The operating return of 0.3pc is therefore grossly inadequate, particularly given that it is based on profit before interest, there are insufficient returns to pay interest, grow the business, repay debt or provision for succession and retirement,” he said. The top 25pc of producers had an operating return of 6.1pc and the bottom 25pc, negative 7.1pc. The performance of these three groups over the last 38 years is shown in this graph. “It can be seen here that there is a wide variation in industry performance,” Mr Mclean told the audience. 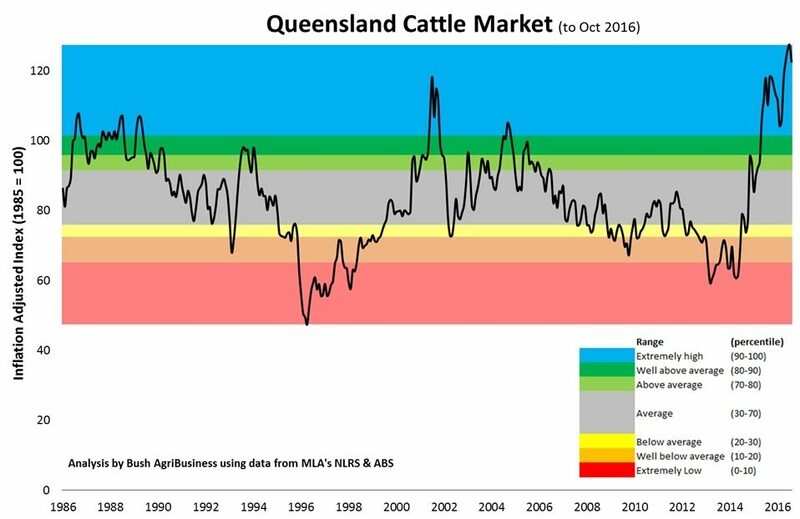 “However, given the large increase we have seen in beef prices recently, will the above continue to apply going forward, or will the significant increase in prices mean the whole industry will prosper? “Two key things can be seen in this graph,” he said. “The purpose here is not to be a killjoy or wet blanket with regard to the current situation – the high prices are fantastic for those in production,” he told the forum. “The question for beef producers of all ages was which group do you want to be in in the future? Those that are prospering, failing or surviving?” Mr Mclean said. “If you want to have a business that can grow, provision for succession and retirement, repay debt and provide for all the needs of the family, and not be reliant on land value increases to increase your wealth, then you simply cannot afford to be an average producer,” he said. How then do young producers ensure that they are an above average producer and do more than survive? Mr Mclean provided some important answers in the form of factors which separate the top performers from the average, and what determines the profits and profitability of a beef business. He also discussed debt as a friend or foe, and highlighted leasing as an option to increase scale and enter the industry. Underpinning all of this was the importance of good record keeping. Following some of these guidelines would allow beef producers to capitalise on the current situation, and best position their business for future above average performance. Tomorrow: David Harland from FinH talks succession planning with young people attending today’s Roma Young Beef Producers’ Forum.